Send a friend a Yogi well wish & 2 free tea samples. Send them a personal message from you. 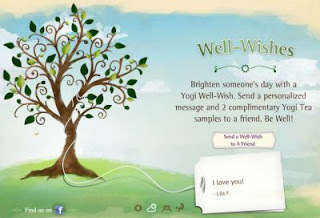 Click the link below to go to the Yogi Tea website and click on send a well wish to a friend. Once the page comes up fill out the to & from forms. You will send it to their email address.